We invite you to live the great passion of Argentines: football. 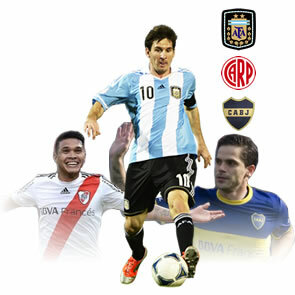 Argentine football is famous all over the world due to its historical tradition and the large number of players representing us in different countries. The best way to enjoy a game in Buenos Aires, Argentina, and the possibility of watching River Plate and Boca Juniors in their stadiums. Fans of the world's most famous sport, football (as it is called internationally), count the months, days and hours waiting for the game with the eternal classic rival of a lifetime. Whatever the league, each team has its own archirival on the field of play. Some of the most relevant classics worldwide are Barcelona-Real Madrid (Spanish league), Manchester United-Manchester City (Premiere league), Juventus-Milan (Italian league) and many other examples. However, none of them has the transcendence and adrenaline of a classical classic such as River-Boca. Whether they play for the Local Championship, the Argentine Cup, the Conmebol Libertadores of America or a simple summer friendly. How can I watch a Boca River game in 2018? River Plate (Los Millonarios) and Boca Juniors (Los Xeneizes) must face each other in the final of the Argentina Supercup. Boca Juniors reached this final by winning the last Argentine Tournament 2016-2017. River Plate arrives after winning the 2017 Argentine Cup. The final will be held on 10 February 2018, stadium to be confirmed. The Superliga Argentina 2017/2018 is currently being contested. Already played the match of the superclassic in the date 8, where Boca won by 2 points to 1. In this league there is only one match between the same rivals. In order for them to play a new match, it will be necessary to wait for the Superleague (if this format is followed) to take place between the second semester of 2018 and the first semester of 2019. On the other hand, both teams are classified for the 2018 Copa Libertadores. The groups have not yet been raffled off and will begin to take place on 22 January. Just like the edition that River Plate won in 2015, where they faced each other in decisive rounds, fate may put both teams on the road to a new challenge. In these games, they are engraved in the fan's memory forever. Who doesn't want to watch Messi play, the star of world football plays for Argentina. Although he has the best player in the history of football Lionel Messi, his captain and all-time top scorer, he has been denied his sporting achievements. Argentina played in the final of the 2014 World Cup in Brazil, where they lost to Germany in the long distance. In the Copa América in 2015, he lost another penalty shoot-out final with Chile. And once again they faced off in another final, in the 2016 Copa América Centenario, and Chile won the same way. Leaving a bitter taste in the Albicelestes, eager for revenge. And what better revenge than a world cup. After an agony classification of the Argentinean national team, in the last knockout day he already secured his passage to Russia 2018. There will probably be friendly matches prior to the World Cup. You have to be on the lookout for the dates and get tickets to go see La Pulga's national team before its premiere in Russia. Get to know the club's museum and its great history in its 110 years of life. You can visit it every day from 10 am to 7 pm. in Av. Figueroa Alcorta 7549, Capital Federal. In case of a match in the stadium you can see reduced schedules. At the exit of River Museum there is a store, where you can buy team t-shirts and many gifts for the fans of 'Millo'. You can also include a guided tour of the stadium in your tour. To purchase your ticket, both for the Museum and the Tour Stadium, you can do it from here. Relived more than 100 years of history with his glories and triumphs in the Museum of the Passion Boquense. You can also take a guided tour of the corridors of the stadium and the playground of La Bombonera by Boca Juniors. The museum is open daily from 10 am to 6 pm. It is located at Brandsen 805, City of Buenos Aires. What are you waiting for to live the passion of Argentine Football from within? Visit River Plate Football Stadium and Boca Juniors Football Stadium and their museum. Enter stadium field and players changing room.